Despite many power outages and a myriad of other problems, I’ve been working on the latest addition to my Nurgle 40K army. This is a Forgeworld Dreadnought I’ve dubbed “Blastmarker Billy”. This model was a lot of work to paint, so much so I’m not looking forward to painting any other Forgeworld models for a while. I won’t be painting anything for a while as I plan to put away my miniatures, paints, even the entire table for the holidays. Miniature painting used to be a big part of my life, alas I could not maintain steady employment so all my miniatures and paints have been in storage. The minis should be fine but the paints may have dried out as they are in my mom’s garage. Someday I hope to paint some models again. Now all I do is update old blog posts and webpages but if you have something to say about miniature painting or Forgeworld or Nurgle you can leave it below. 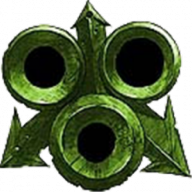 This entry was originaly posted on December 21st, 2006 , it was last edited on March 17th, 2019 and is filed under: Gaming and tagged: 40K, Miniature Painting, Nurgle.